The Lizard Buzzard (Kaupifalco monogrammicus) is a bird of prey. It belongs to the family Accipitridae. Despite its name, it may be more closely related to the Accipiter hawks than the Buteo buzzards. 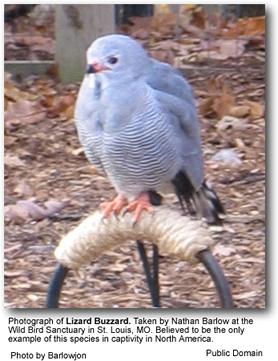 The Lizard Buzzard breeds in tropical Africa south of the Sahara. It is a bird of open woodland, which builds a stick nest in the fork of a tree or the crown of a palm tree. The clutch is one to three eggs. It often sits quietly in the crown of an Oil Palm or on a telegraph wire. The Lizard Buzzard is a smallish stocky raptor at 36cm in length. 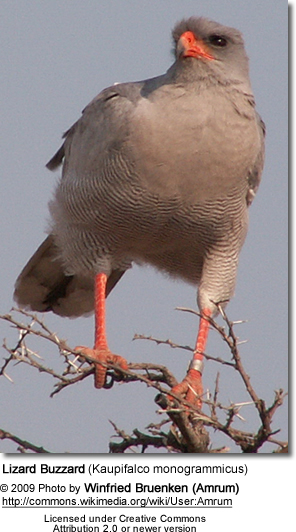 The upperparts, head and breast are grey. There is a vertical black line on the white throat, which distinguishes this species from all other raptors. The belly is white with fine dark barring. The underwings are white with dark tips. The tail is black with a white tip and a single white band. The Lizard Buzzard hunts mainly reptiles and large insects, but also small mammals and birds. The call is a whistled klu-klu-klu.